Our customers expect nothing less than the highest quality finished product in the timeliest manner. We also believe that if our final coated products are of the highest quality, we will continue to earn your business. SAFETY - No unsafe acts. No unsafe conditions. HOUSEKEEPING - Safety & quality depend on good housekeeping. QUALITY - Meeting Customer specifications and expectations. PRODUCTIVITY - Work smart. On time. 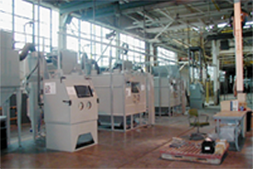 Facility A is utilized for ambient & baked industrial coatings, Teflon® coatings and all other powder coatings. This is a "Batch & Bake" operation with two 12' x 12' x 24' ovens (700° & 800°). Our Grit Blasting room is 18' x 20' x 40'. This facility also features two rubber-curing autoclaves (4' Dia. x 20' and 12' Dia. x 50'). Our Chemical Conversion 5541 Type II dip tank is 4' x 6' x 4'. 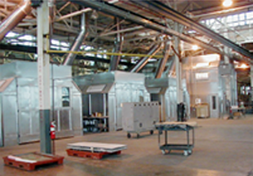 This facility also features a 10' x 10' x 10' walk-in blast booth and five blast cabinets. 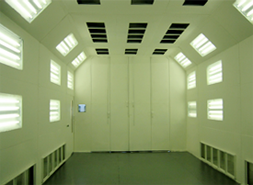 We have three 9' x 14' x 23' heated paint booths as well as two 20' x 20' x 30' heated paint booths. This fixed equipment offers extremely high production capability. Having 50 years' experience as Specialty Applicators, AST/ACME is only as good as our people. Our labor force averages over 10 years of tenure, with very little turnover. 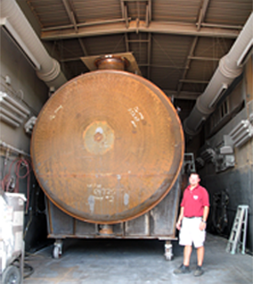 Our NACE Coating Inspector and NAVSEA-Certified personnel ensure the finishing quality of all projects and products. All AST/ACME employees undergo comprehensive training in Confined Space Entry and other necessary task training to assure safe work practices. We both expect and inspect safe work practices. We employ random drug testing on all employees yearly.